We are best supplier of Rubber Belt Conveyor. Rubber Belt Conveyor used to carry guni bundle used to carry cement industries, Pharmaceutical industries packing industries. 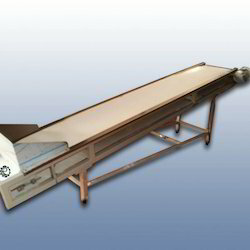 We engaged in offering a superior range of PVC Conveyor to our valued clients. Mounted with high-grade PVC material belt, then conveyor provides robust and durable services in the large-scale industrial setups. 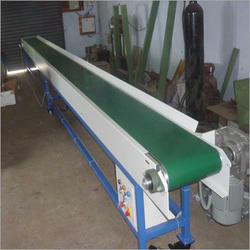 For the complete customer satisfaction, we are providing them desirable assortment of Assemble Belt Conveyor. The offered range of Assemble Belt Conveyor is developed by our competent persons by consuming optimum grade components including updated technology. Apart from this, our offered product range is examined on diverse parameters and provided with flawless finishing which matches the requirements of customers. They are specifically designed and user can use them very conveniently and confidently. Assemble Belt Conveyor offered comes in quality construction design finish as well as make use of precision machined components so as to assure of reliable and consistent operation support. Further, the durable construction finish of these conveyors makes them suitable for use in areas like mining, metallurgy, coal and other sectors. Some of its features include suitable for transferring of bulk materials; allows for quick and easy installation to meet different transferring requirements; can be used in ambient temperature of -20 to 40 °C; can also be offered with support of heat resistant, acidity resistant belts.